Sidelines ROLEX Article: Vicki Baker In It To Win It! A graduate of Pine Ridge Pony Club and a Colorado Native, Vicki Baker is an eventer who has earned the attention and respect of eventing idols such as Capt. Mark Phillips and David and Karen O’Conner. Vicki has accomplished much and endured the toughest of circumstances – including a rotational fall in 1999 that could have ended her riding career. Yet, Vicki has kept her head high and has pushed on to become an internationally recognized event rider and coach. Sidelines caught up with Vicki and asked her a few questions about her eventing career. What do you consider your greatest strengths as a rider? My greatest strength as a rider is my scope in being able to adjust to a variety of horses. As a kid, I rode anything I could get my hands on which meant a lot of horses with challenging habits but I was also given an amazing opportunity by one of my first trainers, Nancy Chesney. She allowed me to ride some of her high level dressage horses. At first, it was on trails and a little jumping just for some cross training and mental release from their grueling workouts but soon I got the opportunity to take dressage lessons on them. I learned so much about impulsion, collection, and self carriage. My devoted parents would videotape my lessons and I would study them over and over again, often in slow motion, reliving the feelings and seeing what I was feeling. It really developed my feel and eye. I had the great fortune to compete some amazing horses at all levels. I learn just as much if not more sometimes from the novice horse doing his first course as I do from riding an advanced horse. I do love the speed at the upper levels tough. That’s a tough question. Throughout my riding career and travels throughout the US, as a groom at the Sydney Olympics and when I worked for the USET as the assistant director of Eventing, I’ve had the unique opportunity to spend a lot of time with a lot of amazing horseman and horsewomen. Some of the most influential in my life have been the O’Conner’s, George Morris, Jimmy Wofford, Capt. Mark Phillips, Jim Graham, Becky Holder, and Sally Ike. My career was built on the skills they helped me develop both in riding and horsemanship and the inspiration and guidance they gave me to the top levels of the sport. What do you enjoy most about teaching eventing? I love the people. It’s a unique group of horsemen and horsewomen. To truly do this sport right you have to be a well versed rider. Detail oriented for dressage, brave for XC and accurate for Show jumping. I’m thrilled at the resurgence of the traditional 3-day format at the preliminary level and now the even the training level because that is where true horseman are made. You must know how to care for and train your horse in a manner that keeps them happy and expressive for dressage, fit and brave for XC and still physically sound and capable for show jumping. The traditional 3-day format really teaches this and this is what I love to teach. Lately there has been a trend towards eventers have 3 different coaches, one for each phase. While I found this helpful as a top level rider I think this is wrong for the lower level rider and does a disservice to the horse. I believe that an eventer needs a coach that brings it all to the table – one that can relate your dressage skills to your show jumping, that can teach you how to condition whilst schooling your dressage movements, or practice your adjustability for SJ during your gallops sets. Instead, lower level riders are spread too thin between 3 trainers and trying to ride in 3 different ways. Being able to help a horse and rider combination bring it all together is my strength as a coach and trainer. Can you tell me about being a physical therapist? How does it impact your equestrian business? Becoming a Physical therapist was always my “plan B” should I ever have to give up my love of riding and I structured my undergraduate work at CSU to ensure I could implement plan B if I needed to. I’ve always approached my riding and training biomechanically. I’m fascinated with movement and I am a “closet” veterinarian when it came to soundness issues. I love to feel tendons and wrap legs. As my physical limitation left over from my fall in 1999 got worse and worse in 2005 it became clear to me in that I needed pursue my plan B and it’s been an amazing journey. Not only have I been able to restore my own soundness through what I learned as a PT but it has opened up many opportunities to help other riders and their horses achieve soundness and improve their biomechanics and performance. I’ve also proudly been able to help a few riders with traumatic injuries much like what I had and I’m in the process of helping one noted horsewoman who suffered a major stroke return to what she loves. I understand you are also heavily involved in natural horsemanship. How do you incorporate that into your training? I would say that I was a natural horseman before the term became popular. I’ve been around horses most of my life and I’ve always had a way of working with them that taps into their psyche and I work with them as members of their herd not as a human in their herd. I’ve imprinted a lot of foals and started a lot of horses and each of them has taught me something. I’ll never forget the first time I rode my mare Fine China down the center line of her first advanced horse trails. I had tears of joy running down my cheeks. To take a foal that was born into my arms, that I solely trained, and to go an entire eventing career without one XC jumping fault, save for one event with a few glance offs of corners was truly remarkable and I feel it is my natural horsemanship, my ability to gain a horse’s trust, that helped me achieve this. I was informed that you had a pretty bad fall – I was actually told it almost killed you. If you don’t mind, could you tell me about that and how it as impacted your eventing career? Yes, I fell at the Radnor CCI** in 1999 on a young prospect. It was a simple gallop fence right in front of the trade fair. I think he got distracted on take off and we ended up having a rotational fall at a high rate of speed. My horse was fine luckily; I broke his fall well. I, on the other had did not fare so well as you might imagine in a fall that broke the tree of my saddle with me in it. The worst part of it for me was missing out on the chance to compete at the next weekend’s Olympic qualifying event at Fair Hill. I was a rookie hopeful for the 2000 Sydney games. I was told by the Olympic selectors that if I could make it to Rolex the next spring that I would still be considered. So with that deadline looming my rehab began. This was my first real experience with Physical Therapy and I put everything into it I could. Unable to care for myself I moved back in with my folks and they diligently took me to PT and to the pool so I could rehab a severely dislocated hip and fractured pelvis among other injuries. Looking back now as a PT, there was really no way I could have been ready to ride at Rolex even if all my rehab had gone well but I wasn’t about to give up on my dream of going to the Olympics. In February, although my rehab was going well, I began to question whether I would be brave enough to go XC again after all this time off. I’d never had a fall that I didn’t “get back on the horse” right away and certainly never a fall or injuries of this magnitude. So, against doctor’s orders I snuck out to the barn, I wasn’t even supposed to be driving yet, and hobbled around on my crutches to tack up one of my mares. I just had to see if I could do it again. I was still so weak but I grabbed mane and clucked and my mare packed me around our XC course. Tears of joy for knowing I still had my cajones were quickly replaced by excruciating pain. I had undone 5 months of rehab. So although I knew I could do it mentally, now I knew I could not do it physically. Sydney was out. But, I did ended up going to Sydney as a groom for Becky Holder(Douglas back then). It was an amazing opportunity and almost as good as I had imaged riding would be! Well, I have a beautiful 5 year old daughter, Katherine, who loves horses so I’ll likely be playing horse show mom this summer. 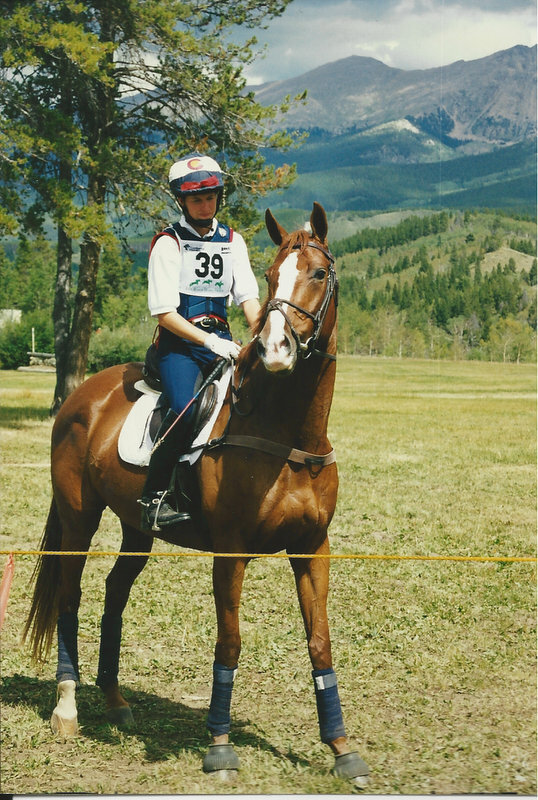 I will continue to develop Vicki Baker Eventing based at Gargot Farm’s in Berthoud, Colorado. I have great plans for adding a XC schooling area focusing on terrain, ditches and more to this already beautiful farm. I also teach clinics locally and nationally. And, I will continue to work part time as a physical therapist at Physical Therapy Doctors in Berthoud. I also plan to keep my hat in the competition ring on a wonderful Connemara Stallion named Mosi and am actively seeking other mounts on which to compete. I would have to say that returning to the advanced level of competition to be a contender for the 2004 Olympics after such a traumatic fall is my biggest accomplishment thus far. Don’t get me wrong, I didn’t do it alone. I worked extensively with a sport psychologist and was guided and nurtured back by the USET developing riding program and specifically David O’Conner and Mark Phillips. What I learned from them was at the end of the day it’s your inner strength that you have to draw from to make it happen; so I did.